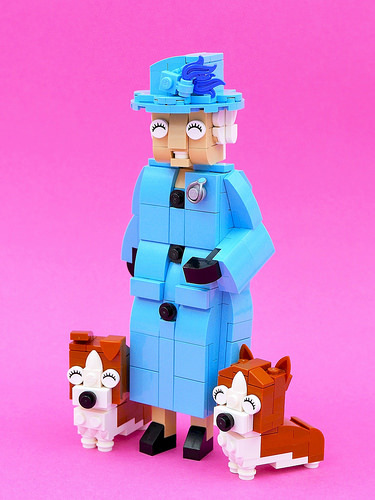 In addition to being the grandmother of Prince William and Harry, Queen Elizabeth II is known for her love of Corgis. She has owned several over the years and, if given the chance, would probably adopt this glorious puppy built by BrickinNick. 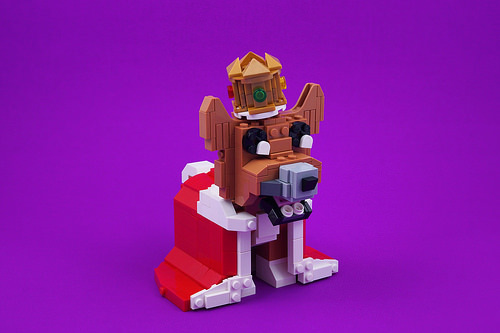 BrickinNick’s chibi-like design is simply adorable, from the dog’s panting mouth and big eyes to the cape on its back and tilted crown. The small arches also make for nice, little, perky ears. I can almost feel the warm and wet puppy kisses! The Queen recently lost the last of her famous pack of Corgis, a dog named Willow who starred with Daniel Craig in the 2012 Summer Olympics Opening Ceremonies. Our condolences to Her Majesty.